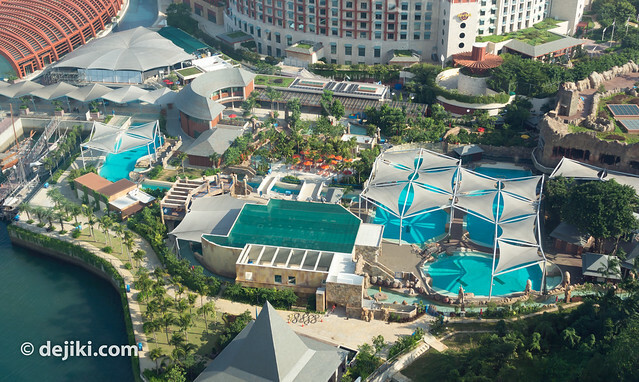 It is just weeks before the opening of the Marine Life Park (MLP) at Resorts World at Sentosa (RWS). 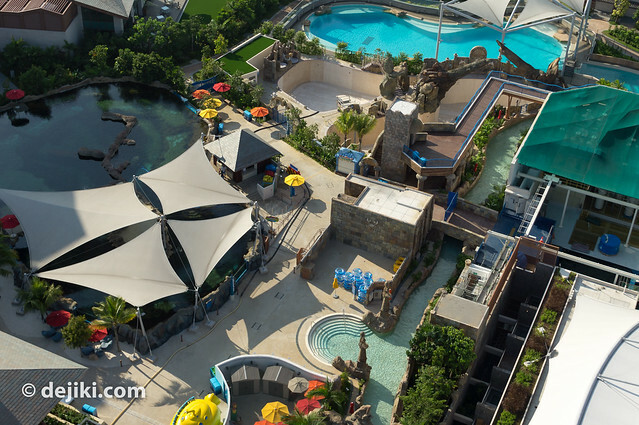 Let’s have a look at the park in the eighth issue of Marine Life Park – from the air. NEW!! Marine Life Park will be open to public no later than 1st December 2012. Overview of the “Equarius Side” of Marine Life Park. The S.E.A. Aquarium building (white roof) is so clean and white after the repairs seen in the last update. According to Zooish, this is the Open Ocean Habitat – the largest tank in the S.E.A. Aquarium. 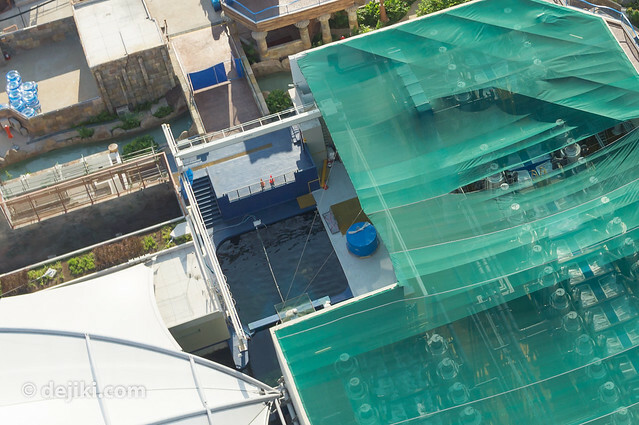 A peek at the pool at the top of the Aquarium building. Rainbow Reef on the left, and some parts of the Adventure River on the right. The “activity zone” at the shark-tooth-shaped pool is still dry. Seems like they’re still repainting the walls. 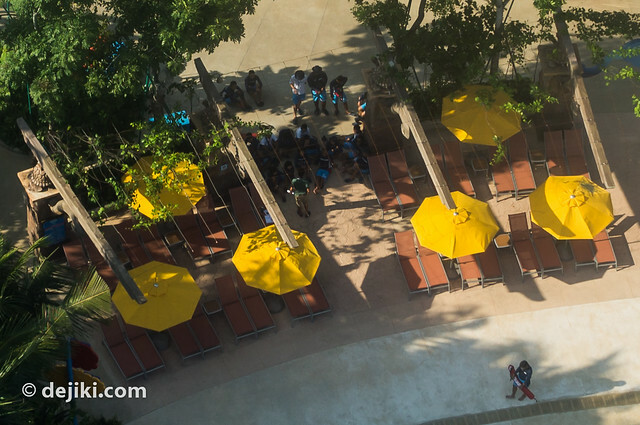 The pools near it (and Adventure River) look so clean and ready for guests, though. A group of park staff gathers near BluWater Bay. Big Bucket Treehouse, a playground for children, has all its water features turned on. There are a lot of sprinklers, buckets and short slides for young children. Here’s a shot of BluWater Bay, the wave pool, in action. Doesn’t it look great? 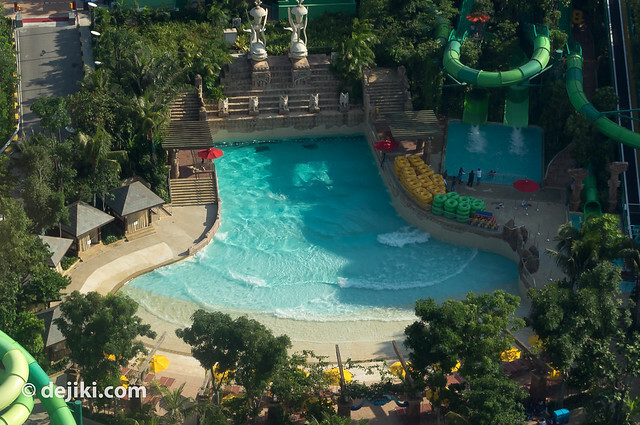 Given the size of the pool, we should expect soothing waves, not the those crazy-powerful tsunami waves (Have a look at Disney’s Typhoon Lagoon). Towards right, the two slides were also operating. Most of the slides and BluWater Bay were running for the past week, with the park staff testing (and enjoying) the facilities. *Note: These are tentative rates and are not officially announced by RWS. Thus, the rates are subject to change. Use this information only as a rough guide. There will also be packages that include both Adventure Cove Waterpark and S.E.A. Aquarium. 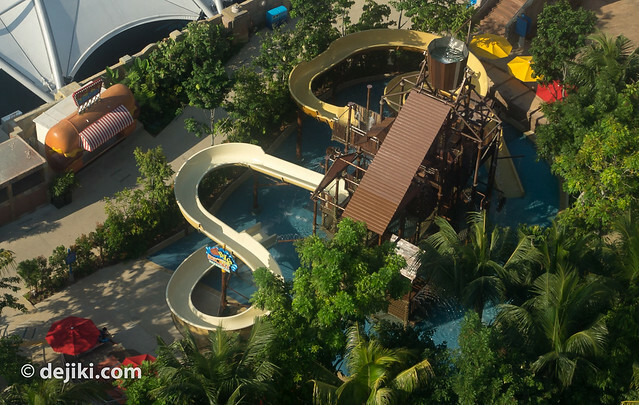 In other news, you might be interested in the list of attractions at Adventure Cove Waterpark. *Amusement/Thrill rides and attractions within this zone only. Does not include Marine Life exhibits, aquariums, etc. 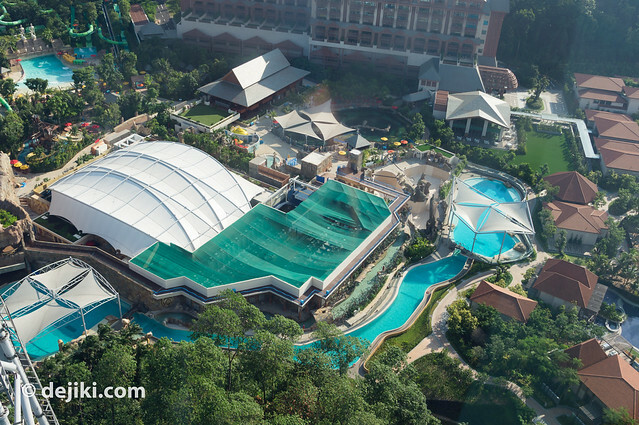 The only wave pool at the park, surrounded with thrilling water rides. Cabanas and lounge chairs form a cozy ring around the shallow edge of the pool. The long lazy river that travels around most areas of Marine Life Park, including the Grotto (rock building) and overhead tanks. A long water slide that goes through spiral cone elements. A high speed water slide, also known as a “Hydromagnetic Coaster” which uses a conveyor belt as a (somewhat launched) lift hill. The blue 2-rider in-line tubes are used at this ride. A long water slide that is mostly enclosed. A dual-lane slide for two riders to dive head-first on a mat, racing down several dips. A treehouse-themed playground set in a shallow pool, with two slides. A shallow pool with fountains. Any clue if MLP will actually open before 7 Dec? BTW, the white-roofed building is just one single tank (albeit the largest of them,called the Open Ocean Habitat). 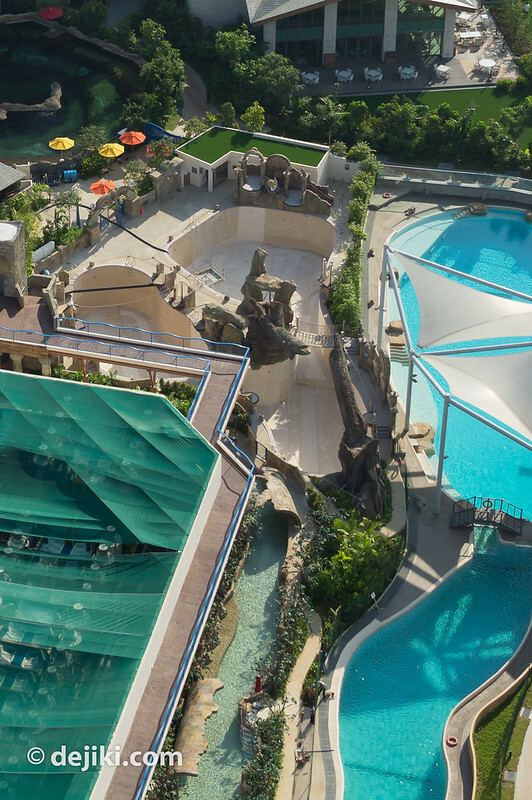 The whole SEA Aquarium runs underground from Typhoon Theatre at MEM and under most of Adventure Cove Waterpark. Thanks for the clarification. The same building is supposed to house Ocean Suites, do you have any info on how it’s supposed to be like? (e.g: Will there be aquarium view/”underwater” windows, like some suites at Atlantis – The Palm Hotel, Dubai). Not sure on MLP’s opening dates, although previews and soft opening are expected to happen at least a weekend (or two) before 7th December. Also, the park will have limited guest capacity during its initial opening phase. Yup, the Ocean Suites have full height underwater windows looking into the massive tank. I just got an email from RWSInvites. Previews for Invites member are held on 17/11/2012 and 18/11/2012 for SEAA and ACWP respectively. Marine Life Park will be open to public from 1st December 2012, or maybe even earlier. Yeah, I’m hearing November for “public” opening, but not sure if it simply refers to the Invites Preview. I love the wave pool! Such pleasant color and style….